According to the MSF our tires provide only so much traction and that if you exceed that amount your tire breaks loose (you skid or slide). That's true. They also presented to all students a 'visualization' of this in the form of a 'Traction Pie'. Below is a chart that is close to what that visualization looks like. Note that it is NOT *THEIR* chart as I am mindful that the MSF likes to sue people for copyright infringement and they seem to think that anything they say in their curriculum is 'intellectual property' and has great worth - not true. 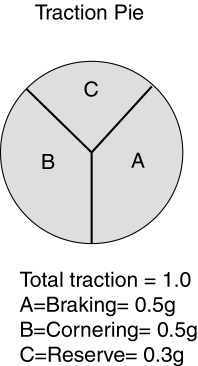 The idea, according to the MSF, is that the circle represents the amount of traction a tire provides. They go on to suggest that there are FOUR 'pieces' of that circle (pie), the sum of which is the total pie: Acceleration force, Braking force, Cornering force, and Reserve (unused). The Assertion by the MSF is that if any 'piece' of that pie is Reserve, then you are not skidding/sliding. Fair enough, but that is not the same as saying you are not in trouble. Well, if you were a fourth grader, I suppose, you might buy that and that is the fundamental problem with the analogy - it is a dumbed down concept that is easy to grasp, but is wrong and virtually useless. For example, instead of having FOUR 'pieces' that pie can have ONE, TWO or THREE 'pieces', and NEVER FOUR. If the tire is motionless, there is only one 'piece' (Reserve.) 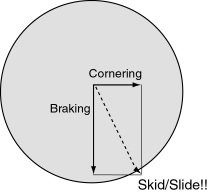 If moving in a straight line, there are AT MOST two 'pieces' (Acceleration OR Braking, and Reserve - if any.) 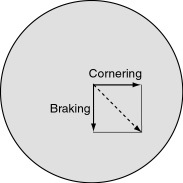 And if moving in other than a straight line there are AT MOST three 'pieces' (Acceleration OR Braking, Cornering, and Reserve - if any.) So we already know that the visualization is mis-representing. 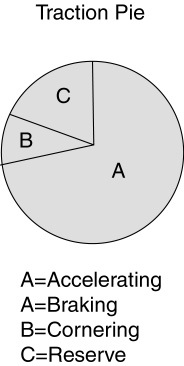 At least in the figure I drew for you above I have attempted to show you that the piece of the pie shown as 'A' is EITHER Acceleration force OR Braking force. In other words, the pie can have no more than three pieces. Nothing earth shattering about that mis-representation, but please bear with me as we next try to determine anything of value from the MSF's 'Traction Pie' concept. Let's first look at the circle itself. The MSF would have you believe that it represents the traction provided by a tire. Fine. 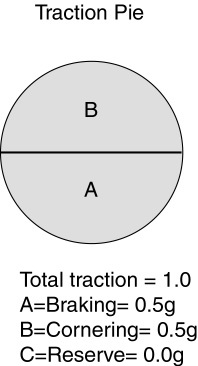 But there are no numbers associated with that circle so we must conclude that it represents 100% of that traction. And how much is that? I mean it is a finite number, right? Let's be charitable and say that *YOUR* tire can provide enough traction so that it supports 1.0g of force (Acceleration, Braking, Cornering.) 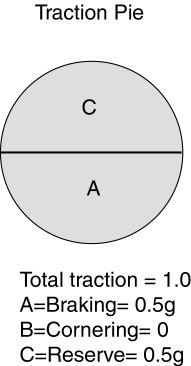 So, I suppose, and the students will as well, that the circle would represent 1.0g. That is, the 'pieces' of the pie, when added together will amount to 1.0g. There is a problem already. The amount of traction your tire provides is NOT independent of the roadway surface. If that tire is in the air, for example, it supports ZERO Acceleration, Braking and Cornering forces - thus, I suppose, that means there is only one 'piece' of that pie - Reserve. And since there is a Reserve 'piece' of that pie, the MSF would claim that you are not in trouble. If your tire is in the air you are NOT then in control and that, to me, means that you ARE in trouble. So let's pretend that all the students know that and that the drag factor happens to be 1.0. Is the visualization then right? No. 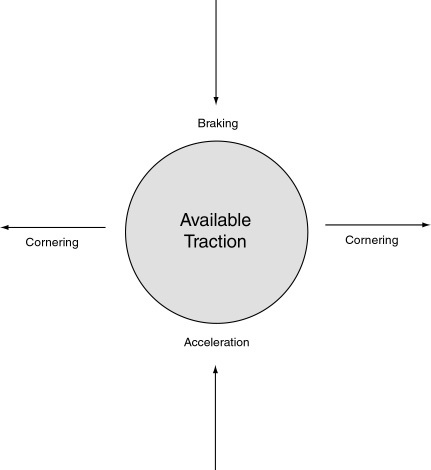 What would the diagram look like if the tire was moving in a straight line, that the drag factor was 1.0, and it was braking at a rate of 0.5g's? Would you agree that this is a fair representation of that scenario using the MSF's 'Traction Pie' visualization? Well, I'll not quibble here except to say that almost everybody would because they will be dealing with a false assumption, but for practical purposes I will agree that it is fair in that it shows that a good deal of Reserve exists and the tire is not skidding or sliding. 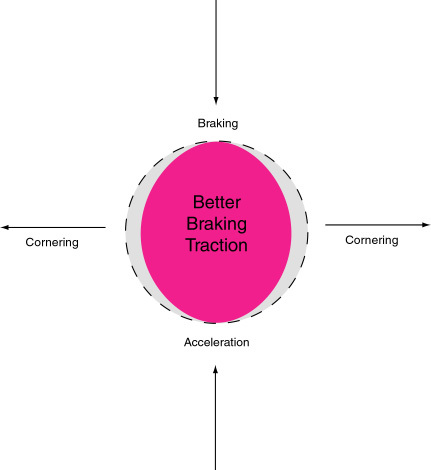 But let's change the scenario and say that we are looking at the 'Traction Pie' for a tire and that in addition to supporting a 0.5g braking force is also supporting a 0.5g Cornering force. Again, total traction supported by the tire is 1.0. Is, then, this diagram fair and correct? Since there is no Reserve 'piece' of the pie left, is this tire about to skid or slide? The answer to those questions is a decided NO! Though it shows the assumptions made using the concepts earlier explained, it totally misrepresents reality. The tire in this example is nowhere close to a skid or a slide - there remains a Reserve of about 0.3g's of force that it can support. How is this possible? Simple. 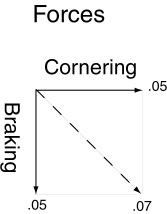 Braking and Acceleration forces are ORTHOGONAL (Perpendicular) to cornering forces. So that, according to Pythagoreas, instead of the total force being the sum of those forces, it is the Square root of the sum of the squares. Thus, the amount of traction used in the example is NOT 1.0. Instead, it is 0.7. That leaves 0.3 in Reserve. It would be clear that since the vectored total forces line did not go beyond the edge of the circle that the tire was not about to skid or slide. And if we then increased one of those forces from 0.5g's to, say, 0.9g's, the resulting diagram would look like this and a skid or slide would already have happened! Please pay attention to what was just said.Â The MSF teachings have left virtually every graduate of their classes with the absolute belief that if you are in a turn you must NOT use your brakes without first standing your bike upright. What you just saw is how preposterous that belief actually is. 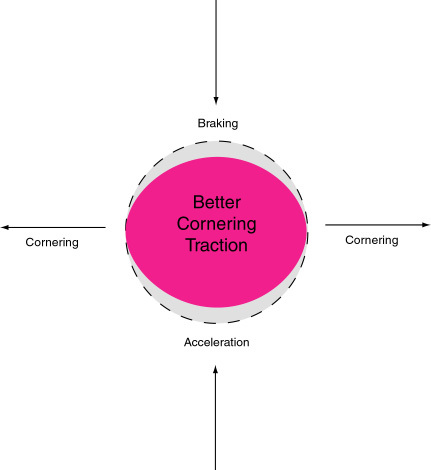 Unless your bike is leaned over at close to 45 degrees and, therefore, taking nearly 1.0 full g's of lateral (cornering) force, you have the ability to use somewhat more braking force than you think without exceeding the traction limits of your tires. How much? Well, let's look at a normal and reasonable example. You are traveling at 50 MPH in a curve that has a radius of 335 feet. 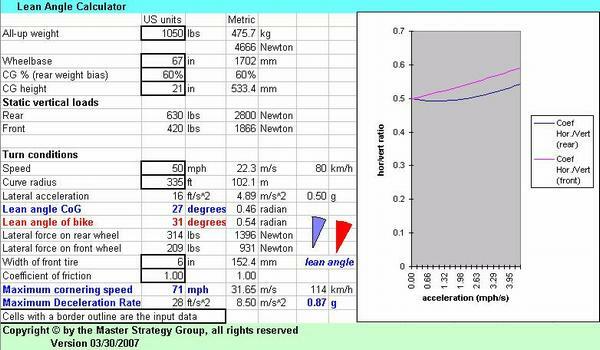 As a result, your bike is leaned over at an angle of 27 degrees and you are experiencing lateral acceleration of 0.5g's. How hard can you brake in that case without exceeding the traction your tire's provide? Here is the output of a model I created that shows this scenario for you. Note the 'Maximum Deceleration Rate' line near the bottom. Now, please pay attention! The model shows a maximum deceleration rate that is higher than real! That, because until I modify it to include the effects of weight transfer in the calculation of that maximum for each tire, it shows a result for an imaginary vehicle having only a single tire - thus, without weight transfer effects. But, hey, all of that defies the dumbed down approach - designed to 'make learning easier and more fun', so don't hold your breath.